Recently, it's been circulating around the social vineyard about the video of a so called "sumpah laknat" by a certain Saiful Bukhari. 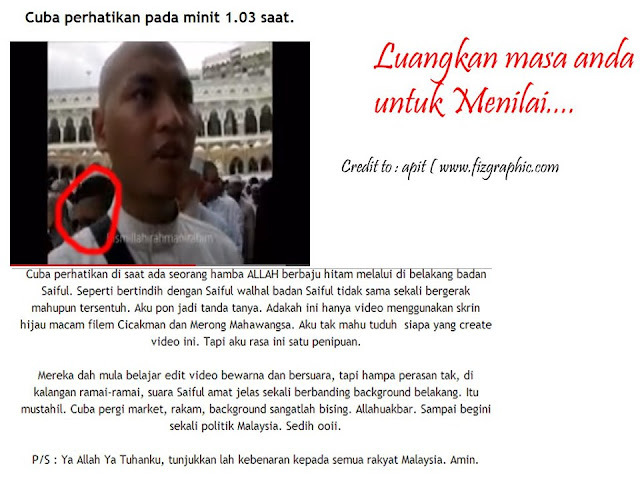 Though the reason of writing this post isn't to argue about Saiful Bukhari vs DS Anwar Ibrahim, I'm personally making a beef with people arguing about the authenticity of the video as per the attached image. As a so-called "graphics" person to give out such comments, this shocks me. Though I'm no pro videographer, but I've did some before. And this person clearly has been living under the sewer for some time already. If not, he'd known about the existence of a technology.. you know.. noise-cancelling-microphone? It's been implemented since the introduction of iPhone4 & later upgraded in the iPhone5! In case of doubt for such technology, here are some references for some enlightenment. JABRA - How it works? With regards to the accusation of video superimposing & positioning of the background. So, moral of the story, always do a little research before believing such amateur comments.